Having an aquarium equipped with an overflow system is required for a number of reasons. If for instance, you need to top up water and maintain the aquarium at the same level at all times then it would be a good idea to have an overflow system that can channel the water to some other place without wetting the surrounding areas. Good idea especially if you place the fish tank in a living room with a carpet. One of the most direct approaches one would think is that by drilling a hole on the tank top level and attaching a pipe would solve all the problems but there other ways which would work the same as well. The design of an aquarium overflow system can be simplified and accomplished without doing any modification that requires drilling that can cause your fish tank to be void of warranty. Seems to make sense because you wouldn’t want your thousand dollars 100 gallon acrylic or all-glass newly purchased fish home to have holes drilled in it. The system can actually constructed and achieved using the principle of atmospheric pressure water balancing and overall all these only requires some piping installation to be implemented. Let’s look at the diagram below for the whole working principle before we move on further to explain on how the overflow system works. Based on discussion that we had earlier and then explained in details, what you can see from here is that (on the left diagram) there are two fish tanks which are basically connected by an inverted U pipe. If let’s say the piping is filled with water, according to atmospheric law of water balancing under the same pressure, both tanks should end up having the same water level. For instance, if let’s say you decided to select and fill either one of the tanks with some water, theoretically, the liquid should flow to the other side as well until both aquariums are having the same water level. 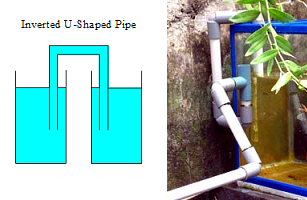 Now let’s consider this scenario, in order to design and construct the aquarium overflow system, what you basically need right now is to remove the other end of the inverted U pipe and then visualize that instead of a tank there, you now change it to a pipe connection that diverts water to other location (as illustrated in the picture on your right). Sounds easy? Well, it's fairly straightforward and if you manage to construct the exact duplicate projected above, you don’t ever have to ever worry about your aquarium overflowing anymore. However, one thing you will need to take note over here is that if you notice and study the diagram carefully, you will notice there’s an exposed pipe to the atmosphere which basically is needed to make sure that there is a balanced pressure between one end and another so that water can flows through. Another advantage of having an overflow system is when you have a trickle filter or sump filtration system set up for your saltwater aquarium that pumps the water around.